“Animals are not ours to eat, wear, experiment on, use for entertainment, or abuse in any way,” is the brand proposition of the world’s largest animal rights organization, PETA. The acronym PETA stands for People for the Ethical Treatment of Animals, and is known for their extreme stance on the treatment of animals. This non-profit organization is based in Norfolk, Virginia and has over 3 million supporters who avidly believe in it’s mission. The four main areas that PETA focuses on where animals suffer the most are factory farms, clothing industries, laboratories, and the entertainment industry. There are many reasons for PETA’s success as a non-profit organization since its founding in 1980. One main reason for the organization’s success is how they have fostered their strong brand personality. Emotional appeals come into play as you continue onto the main page of the website and see horrific images of distressed or dead animals. PETA uses this technique to form their brand personality because people’s emotions are triggered when they see either sad photos of animals, or even victory stories of animals that PETA has saved. 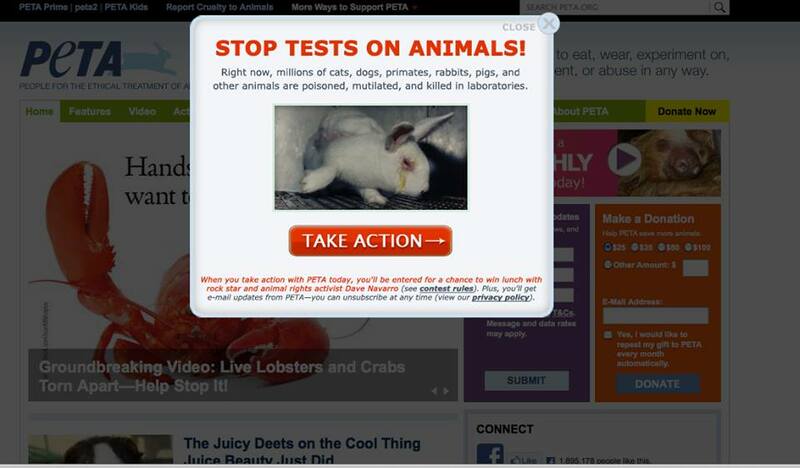 PETA keeps their promise of saving more animals by having a readily available donation section on the homepage. Supporters who are moved by PETA’s mission are able to fill in their information and donate to save more animals with just one click. This allows supporters to create an emotional attachment because they aspire to create an ideal self by donating to the cause. A large portion of PETA’s success can be attributed to their use of celebrity endorsements as a means of persuasion. Celebrities such as Bob Barker, Carrie Underwood, Simon Cowell, and Audrina Patridge have all teamed up with PETA to support their mission and cause. One campaign in particular that remains consistent with PETA’s brand personality is represented by former Miss USA winners who advocate the idea that they would rather go naked than wear fur. These advertisements are meant to make the viewer feel uncomfortable in an attempt to call people to action. Even Academy Award winner, Joaquin Phoenix, has paired up with the organization to make an influential video that relates to his own personal experience dealing with animal cruelty. PETA’s brand personality continues to be strengthened because supporters are able to express their identity by representing the organization. The combination of these three characteristics create an overall concept of what to expect of PETA, which is both distinctive and enduring. Other than these three characteristics (aggressive, emotional, and persuasive) what comes to mind when you think of PETA? Do you feel that their brand identity is distinctive and memorable? PETA’s call to action tactics are very interesting. I do feel incredibly uncomfortable when I see their commercials on TV, the sad music playing in the background, it is terrible. It is not even as easy to turn the channel because odds are that it will be on another. They do a great job of getting their organization out there and letting the public know what they stand for. The fact that they are using celebrities that are so well known also helps. Simon Cowell is known as someone who is very harsh and he does not really seem to care about anything other than being blunt and negative and to see him associated with this organization shows “someone that doesn’t care about anything cares about the cruel treatment of animals.” That spoke to me while reading this post. I, however, have never donated money to PETA-but I do support their organization and prevention of the cruel treatment of animals. I’ve lived in the country all of my life so I am constantly surrounded by animals and their message is very effective. PETA takes a much difference response as a way to engage people in their cause. By using the tactics that range from the emotional commercials with disturbing images of animals in distress looking up at you as sad music plays, to almost angrily shaming you into agreeing. This shaming that PETA does must be effective because I assume they are making plenty of money to keep these commercials around. I do love animals and wish that they were treated better, but I also feel uncomfortable when the commercials come on and I do not donate. I can’t say I’m a fan of PETA but they do a good job of keeping their brand prevalent in the media. They use people’s emotions and love for small fuzzy animals to guilt them into donating money which has proven extremely effective. However, they’ve had some pretty massive blunders in the last few years that seriously compromise their brand. Specifically I’m referring to the reports that they kill around 90% of the animals they “save” every year without even attempting to get them adopted (beware the sad pictures but for details see http://www.huffingtonpost.com/nathan-j-winograd/peta-kills-puppies-kittens_b_2979220.html ). That’s more a little disturbing for a group that advocates no-kill shelters. Maybe if they weren’t spending all that charity money on making shock campaigns with naked pseudo-celebrities, they could actually get around to saving some animals. It’s really quite a testament to their PR department that this story didn’t get too big and destroy them as an organization. 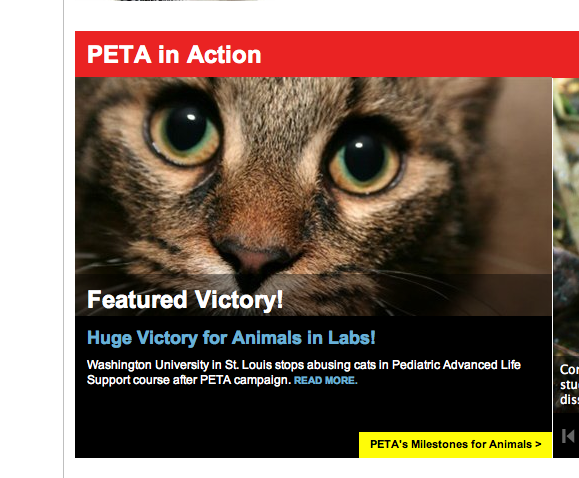 I definitely believe that PETA’s name brand has been, and continues to be, efficiently promoted in the news and media. I have heard numerous accounts of PETA protests that include throwing paint onto celebrities in fur coats, performing crazy stunts and acts, and comparing killing animals to a modern day form of the holocaust. While we may believe their actions are outlandish, they get their message across and are a well-known institution even to those who do not believe in their message. While they are aggressive in their behaviors, it is these behaviors that allow PETA to make national news and promote their cause to a wide audience of people. These extreme behaviors ensure PETA media coverage and donations. PETA is an example of the pioneer effect we read about in Twitchell’s A Branded Nation. Because they have kept the same brand identity and characteristics for so long, they are able to grow awareness for their cause more successfully. The first time I encountered PETA was after Warped Tour six years ago. It was one of the best days of my life, and as I was leaving I was handed a pamphlet on PETA. When I opened the pamphlet I was shocked by the graphic images of animals in horrible living conditions. There were also pages on animal testing, where the animals looked like they were close to dying. It was so depressing. On top of that there was a section that listed all the bands at Warped Tour that supported PETA, which helped draw people to their cause. It was great marketing on their part by including bands that support their cause, but a terrible way to end the day. It turned me away from PETA, but I still think about those images until this day, so regardless their advertisement was effective to a certain extent. I don’t really understand PETA. I have never personally seen any shelter or pet that has been saved by PETA. They spend so much on their two minute commercials and high dollar actors that I cat fathom how they would have any money left to help animals. I always turn the channel when I see one of their depressing commercials that only make you want to cry. Now don’t get me wrong, I truly care for animals but it makes me sick how PETA has made so much money on the weak hearted people who donate to them. I am a huge supporter of animals rights but I cannot say that I am a supporter of PETA. Some of their less than positive actions in the past have turned me off from showing them some support. With that being said, I do think that their marketing hits you hard. Not knowing their past many people could easily fall into their trap. They focus on affecting peoples emotions and it seems to work to their benefit. I have to say that I am definitely a fan of saving animals from cruelty and would love to join an organization that promotes this. However, PETA is incredibly in-your-face and sometimes too aggressive for me. I think on the surface PETA sounds great, but their aggressive tactics turn people off from wanting to join them. When I think of PETA I think of elitists. They come as off as thinking they are better than a small-town group that has the same goals as them. They seem like they are trying to run the show all the time. Of course they are memorable; the website itself will be burned into anyone’s memory forever. But are they memorable for the right reasons? I don’t believe they are. At least as often as they would like to be. I find PETA to be a crock. I think there are many local shelters you could go to and save an animal to help out your own little community. PETA’s commercials are alarming and depressing. Yes, it makes you want to help- but it also makes you think like this: Instead of spending 2 million or however much money to do this commercial, you, yourself PETA, could be saving those animals and help keep from starving and shaking in fear from your cameras you put up in their faces. I feel strongly about helping out animals who don’t have the ability to help themselves like homeless people do. However, I think it is just as helpful to adopt an animal from your county’s pet pound. No matter what though, the point is to help these innocent creatures, and that’s what we should do. While I acknowledge that PETA has a very strong and distinct brand personality, I do not agree personally with many of their methods. I understand that with the issue of animal rights shock appeal is a good way to envoke an emotional response. However, PETA’s aggressive tactics have even included throwing fake blood at people which I feel is a step to far. Also, many of their celebrity print ads objectify women in a way that is not at all appropriate, often portraying naked women as meat. Their ads can also be incredibly insensitive. For example, one ad used pictures from the Holocaust and compared all meat eaters to Nazis. Overall, while I think PETA’s shocking media choices will keep them in the public eye, I do not think that they are actually helping animals which is their supposed “goal”. I definitely think that PETA does a great job with getting their name and purpose out there. The fact that they play on people’s emotions is really their major strong point. It really is difficult to see pictures of poor dying animals. It really hurts the heart! By making people feel sad for these animals, PETA gains donations. This really is a smart tactic. Most people will remember their commercials just because they were emotionally affected by them. I personally do not agree with animal cruelty, but I do eat meat. Members of PETA have been known to say that hypocrites say that they don’t agree with animal cruelty, yet they continue to eat meat and dairy products. There are lots of food corporations that do mistreat their animals in order to sell their products, but that doesn’t mean every corp does that. I do believe in the idea that we should stop animal cruelty, but the PETA people are also against hunting, fishing, etc. and I think that is ridiculous. It’s the cycle of life! I recently saw a video of some PETA members laying in the streets of NYC basically naked with fake blood all over them laying down in white trays as if they were pieces of meat. I think this is crossing the line of taking it too far, therefore if there is one other thing that comes to mind when I hear PETA it is probably the word “insane.” BUT I can’t deny that they are very strategic and pushy. Their passion can be admired. This has all gotten them a lot of publicity, and probably a lot of followers. In my opinion, the emotional stance that PETA takes is the most effective. I know that the commercials with the starved and beaten animals and sad music playing in the background always tugs at my heart strings. I can’t say that I am a supporter of PETA but I do admire how hard they work to keep their brand circulating. Whether it’s an emotional or aggressive tactic or having your favorite celebrity telling you to “take a stand and donate”, PETA gets their name and cause out there. There is not a person I know who has never seen a PETA commercial. I’ve noticed my friends get more upset over a PETA commercial than a commercial showing a starving child in Africa. This is because a sweet innocent dog who can’t speak evokes more emotion from viewers because they’re so cute. I can’t help but admit that I too am moved by these commercials. Having a dog of my own, it hurts to see animals who are abused. I think PETA does a fantastic job of getting the word out, especially by using social media. Just the other day, I was looking at Miley Cyrus’ twitter and saw her use the hashtag #PETA. Having a supporter as famous as Miley Cyrus is huge. PETA is a great example of how social media (such as twitter and facebook) can affect a brand greatly. When I think of PETA I think of incredibly passionate people that are frustrated in the fact that they can’t 100% change the way animals are treated. There is so much passion in this organization that they will do anything to accomplish their goals. Anything being, throwing things on people, protesting, causing a scene, among other things. While some may have a negative connotation with how PETA handles things, bad press is still press and is getting the cause out there to people. When I hear someone talk about PETA, I immediately know the organization and the goals of it, which is the point of advertisements, regardless of my attitude towards them and how they handle certain situations. PETA definitely knows how to market in some areas. They have so many celebrities behind their non-profit organization that it makes PETA look “cool” and everyone wants to follow it. By having celebrities in their commercials and ads, adds a different approach than most non-profit organizations. PETA knows that most people love celebrities and keep up to date with them, therefore they will see a celebrity embracing PETA and then they will want to do the same. One way they could improve is the way they incorporate music to the images of animals. It does not make me want to donate money. I love every animal and I understand most of PETA, but the sad commercials only make me want to change the channel. PETA is very good at remaining a relevant brand in the media, but mostly due to provocative photos of celebrities (the “I’d Rather Go Naked than Wear Fur” campaign) and disturbing pictures of mutilated animals. These advertising tactics help establish PETA’s brand as one that uses shock to engage potential members. I cannot say that I am an advocate of these tactics, because I would rather be appealed to through logic, or at least some of the less visceral aspects of emotion than shock. Also, PETA’s brand does not have the best history; the organization has far more outspoken critics than fans, and has been associated with agents of domestic terrorism (i.e. Animal Liberation Front and Earth Liberation Front). The association to these groups diminishes any chance of wide appeal, and have had a part in the branding of PETA as a radical and perhaps unlawful organization. Although I do not pair myself with PETA, or have stopped buying certain clothes or meat because of their stance, I still respect their brand. I can recall about a year ago watching a documentary on PETA and their determination to save animals appealed to me. The most effective and memorable part of PETA’s brand identity for me is the emotional aspect. I am an avid pet lover and the thought of anyone harming something so sweet and lovable makes me want to open my wallet to PETA any day! But I am also not naive to the fact that making my heart hurt with the pictures and gruesome stories is part of their plan to get me to donate. PETA reaches into all places that animals are unethically treated and brings them to light. Even after watching their documentary and checking out their website, I would still eat at KFC and buy the cheaper meat at the meat counter. So I guess in retrospect, I am willing to donate to a brand and support its cause, but I am not willing to sacrifice some of the things they hate. I think PETA’s campaign techniques are highly successful with the message they are trying to get across. I think having celebrities advocate on PETA’s behalf is one of it’s strongest campaigns. These celebrities have an endless amount of fan base that when you see your favorite celebrity reaching out for the cause, it makes you want to as well. When well known celebrities are asked to participate I would believe it is hard for them to say no without looking like a “jerk”. This benefits the organization by increasing it’s support. I also think the campaigns target all audiences whether you are for or against the message. Of course the message is directed to those who still eat meat and wear fur, but those who agree with the campaign are more likely to get involved and spread awareness. Since the organization has an outstanding number of supporters, it allows PETA to push the envelope. I am 100% in support and favor of PETA. I have been a vegetarian now for 7 years, and I agree with what they are doing to make society aware of the problems within shelters and animals worldwide. So what if they are “sad” and “aggressive” , they hit the hearts of the viewers and the viewers donate money- there is nothing wrong with that. More and more people need to understand that animals are suffering and their only hope is us, so yes the images can be rough to look at and the commercials can bring people to tears, but it’s all real. This article even talks about the effect PETA has on people and viewers, those pictures and the music in the background are all things people will always remember and that is their point. I don’t think there is any problem at all with the way they advertise, in fact I think they could show even more of the tragedies and horrific images of animals. PETA’s use of marketing is outstanding. Their doesn’t seem to be anything laid back about this organization. They seem to be aggressive in every single commercial I’ve ever seen, and each commercial seems to be getting more and more graphic and more sad. They are really trying to get inside people’s heads and make them get their credit cards out and donate. I mean who can stand to see puppies and kittens tortured like that? It’s heartbreaking and their ability to manipulate emotions earn them a lot of money. Honestly I have donated in the past because I love animals and the guilt from the commercial got to me. When I think about PETA the first thing that comes to my head is the over dramatized commercial “in the arms of an angel.” I think all of these techniques used are very effective because it reaches out to the public in a memorable way. They are leaving us all with a thought in our mind so that even though most people wont do much about it they still get a sense of guilt for it. I have many vegan friends that are huge supporters of PETA. I can totally respect its goals and motives but in my personal opinion I am guilty of choosing to stay uninformed about these topics so I don’t feel the guilt of wanting to support these causes. So I agree that their tactics are effective but sense its such a personal choice its hard to make people choose to support the issue of animal cruelty.